Halloween is just around the corner guys! I got back from Louisiana this weekend (post coming soon!) and Josh and I immediately got to work getting our apartment ready for fall. We picked out our Halloween costumes, got all the upcoming Halloween parties written down on our calendars, and I fell down the rabbit hole of looking at cat Halloween costumes. You guys… the first year we got Punkin we tried to put a hat on him for Halloween. He absolutely hated it. It broke my heart and we haven’t tried again. Now that he’s three years older and not new in a foreign house I’m hoping he’ll tolerate it a little better. I mean the options for cat costume ideas are ridiculously cute! Questions of the Day: Does your cat like being put in a costume? Would you try again if your cat hated it the first time? Which of these cat costumes is your favorite? Our previous cat would wear a bow tie collar occasionally—we’d put him in it for my birthday!! But cats are funny that way—it’s all about them! I’m not a cat person but these are funny. Going to add them to my costume write up next week and credit you! OMgosh these are so cute but I don’t think my cats would have any part of it. They freak out whenever we try to put anything on them! Neither of my cats would tolerate a costume — or at least I don’t want to get scratched trying to find out — but the lion costume is my absolute favorite! Rawr ? We have a kitten who I’m dying to try out with costumes. I’ll probably get scratched to bits though! Yaaaass! This exists and I can’t wait to tell the world! Merlin has been a unicorn, shark, and an elephant and he hated them all. Too cute! Love the pirate one! Those costumes are so cute! My cat wouldn’t stand for it though, he doesn’t even like being picked up! These are too cute! I’ve never tried to dress an animal before but this year I have a dog so I am thinking about it. Love this inspiration! OMG these costumes are all so cute, God I wish my cat would let me put him into one! He so doesn’t like wearing anything and it was such a struggle to put a cute Xmas collar on him. These costumes so remind me of Sabrina the Teenage witch. These costumes are so cute and funny I love the sheriff! these are hilarious, thanks for sharing! Omg, these costumes are so cute! These are so cute! Wish I had a cat that will dress up. I think ours will just attack us if we try! This is so good haha! 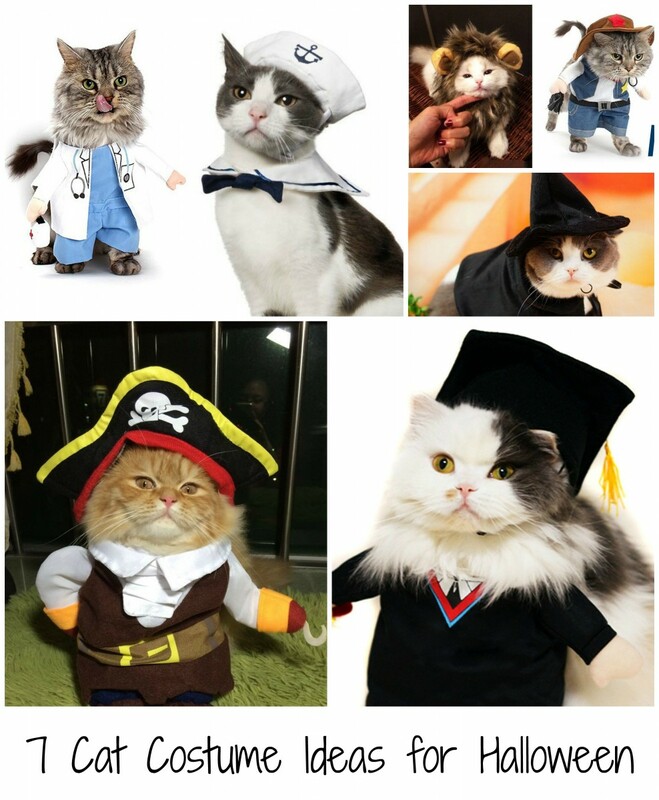 OMG these are all so so cute, although I’m too afraid to dress my cat up haha! These are beyond cute. My bf recently got cats and I can’t wait to put them in these adorable costumes! These are so cute! I have just told my sister that we have to dress our cats up this year haha!